Toast the Roast at Malmaison | Packington Free Range | Born and reared outdoors. Always. Malmaison Hotel in Manchester has launched a new promotion called ‘toast the roast’ with our very own Packington Free Range available on the menu. The offer is available on Sunday afternoons between 1 pm and 4 pm and includes a starter and a main for £15 per person. There are two starter options – mushroom soup or tomato and mozzarella salad, followed by a choice of two roasts: either Cheshire Beef or Packington Free Range – we know which we’d choose! 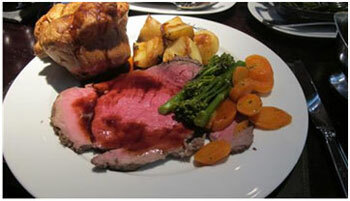 Manchester Confidential gave the Sunday lunch offer a go at the Manchester Malmaison. They seemed thoroughly impressed – especially with our pork saying “the roast Packington Free Range shoulder was another winner. The apple and cider sauce set if off nicely”. If you’re in the Manchester area, why not pop in and give it a go. We know we’re going to. But if you have no plans to be up that way anytime soon, why not follow this recipe to get delicious roast pork in the comfort of your own home. “Slow Roast Shoulder of Pork” – an easy recipe courtesy of the Good Food website taking 5mins to prep and 4 hours to cook, read more here. Sundays have never been so good.